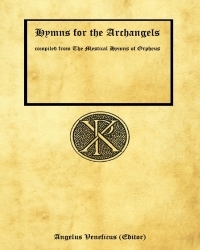 Hymns for the Archangels is a unique publication where the author has aligned the Hymns of Orpheus to the particular archangels. All the Hymns of Orpheus have been reviewed and where appropriate, the correct angelic rulership have been established. This work is ideal for contemplation, meditation, and in your petitions for the help and assistance from the archangels. A simple mediation regime is included in the book which may be used as a mediative exercise or a simple direct request petition to the appropriate archangel for help with a particular issue you are currently experiencing. The book includes a large number of images of the Greek and Roman Gods and Goddesses, together with short descriptions of the entities. If you are treading the Pauline Art path this book will be invaluable, as the Hymns may be incorporated in your angelic rituals. For those who are not treading this path the book will assist you in angelic mediations, and also as a valuable reference work.